Who Wants S’more Of This Slow Cooker S’more Lava Cake? I have terrible allergies. I love when it is the summer time, but allergies will start going crazy. I’m also not a fan of taking allergy medicine because they make me feel so weird. I really love to be outside this time of year, but I am limited on some days due to the pollen content. Otherwise I will be sneezing like crazy and I mean like crazy. My eyes will be watering like nuts. These allergies are a pain because I love campfires. I love having a fire in the backyard. I love making s’mores with the grandkids too! Unfortunately, I am not able to do that anymore because of these darned allergies. I guess it will save an inch or two from my waist line, but I’d rather be out at the campfire enjoying the evening with my wonderful family. One day my daughter and her kids surprised me. They invited me over for movie night. When I got to her house there was a tent set up in the living room. My littlest grandchild ran up to me to tell me that she had figured out a way for me to have s’mores. 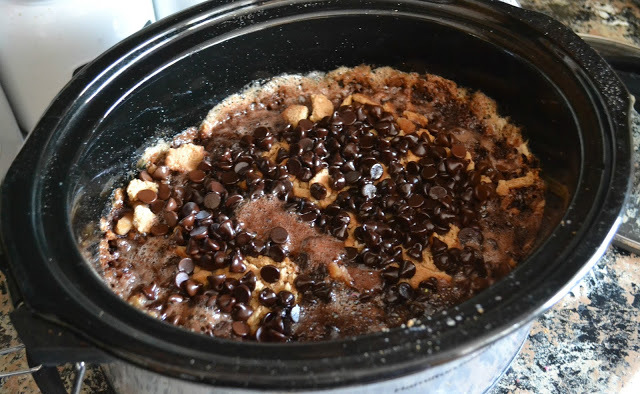 I went into the kitchen and my daughter had found this wonderful s’more lava cake crock pot recipe! It was absolutely delectable and was such a fun night! I make this every so often when they grandkids come over and we have a great time. Recipe and photo credit courtesy of Building Our Story. Quick Tip:Serve with a scoop of french vanilla ice cream. Overnight Crockpot Banana Bread Oatmeal!